This month we would like to congratulate the Bordeaux Trappers for being awarded the Nebraska 4-H Club of the Month for May 2018. 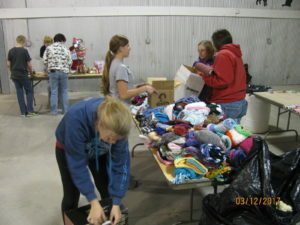 This club from Chadron, Nebraska, in Dawes County, has truly made a difference in its community. The club is dedicated to building strong citizenship and teamwork through various activities. The Bordeaux Trappers have been very busy this year! They visited the local assisted living center, Prairie Pines, and nursing home, Crest View Care Center, to show the residents their projects they have worked on during the 4-H year. They also networked with local businesses and asked for donations for the yearly giveaway table at their annual Shooting Sports competition held in March. 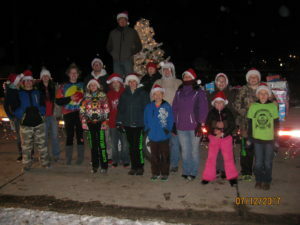 The biggest project for this club is the annual Parade of Lights event held in December. This is the third straight year the club has participated in this event. The past two years they have decorated a float and handed out stuffed animals along parade route. This year, they decided to take the project a step further. With the help of several local volunteers and 4-H members, they crocheted and knitted hats and scarves to give away to kids along the parade route. The club wrapped 270 boxes total filled with the hats, scarves, gloves and stuffed animals. They also handed out candy to children after presents were given out. It is very rewarding for this club to know that they are giving back to their community. No Comments to "May 2018 Club of the Month"